Be real. Set realistic goals. The holidays were not just a few days; they essentially span over an eight-week period. Give yourself compassionate and realistic goals. Goals that you can stick to. Tip 1: Return to whatever eating habits were easy for you before the holidays. They will become familiar again. Put time back into planning and preparing your own nutritious (and delicious) meals, even though the easier thing is ordering take out. If you drank more alcohol over the holidays, maybe it’s time for a dry spell. Work with your brain, not against it. The brain learns habits pretty slowly after repeated experiences. Give your brain the experience it needs to learn with any effort you can squeeze in today. Taking even a small action is information for the brain to learn and repeat. Tip 2: If you feel like you’re starting over with exercise, try incremental short bursts of activity – what you can do without quitting on yourself. Simply 10 minutes of exercise at a time can have positive physical and mental health benefits. Stop worrying about the “not long enough, not hard enough” stuff. Anything is better than nothing. Get used to that and increase activity incrementally. Learn simple tips to master the “mini workout”, and check out the Burst! workout book for 10-minute high-intensity interval trainings that can be done anywhere. Tip 3: Be positive. Health and happiness go hand-in-hand. The mind and body must be in unison to create a healthier and happier lifestyle. If there’s one thing we can’t “fake”, it’s positivity. It must be authentic. If you need a mood boost, cultivate it. Get some help! Hire a trainer as someone to hold you accountable for your goals. At B.-FIT we specialize in motivational therapy. Mr B.-FIT will design an exercise program specifically tailored to your individual needs. He will provide expert guidance to assist you with your fitness journey. Call me now at 302-753-4125 or at the office 302-292-1785. 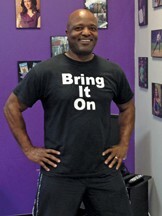 “Passionate, energetic, driven, empathetic, just a few words to describe Mr. B-Fit. My world has been a whirlwind. Born as an above the knee amputee, and having my world rocked by a hideous car accident that left me with a broken back, my outlook was dim. Until one day, I saw an advertisement for Mr. B-Fit. One look at his testimonial and his presence, I knew this was the trainer to see that would help me achieve my fitness goals. Upon our meeting, and a few discussions, what sticks out the most are his words, ‘We got this’ . . . this I believe to be true. I know regardless of the day or days that go by, I know that what I desire to achieve, with the support and guidance and knowledge that Mr. B-Fit shares, I’ll be right where I need to be.” – Rhonda D.